Limited Time Blowout Sale!!! Outperforms Pentium D 3.4! Hard DriveStorage up to 160GB SATA. Make/ModelLenovo C2D Desktop. Desktop is fully functional. Windows 10. Computer Parts. SoftwareWindows 10 installed. We refurbish our computers to a high standard based on functionality. All refurbished computers may have signs of normal usage, such as scratching on their case from being transported. Your first impression is our highest standard, and that's why we designed refurbishing process that produces computers that look great and just work right out of the box. Dell OptiPlex TOWER. TOWER PC DESKTOP COMPUTER. Integrated 10/100/1000 Gigabit Ethernet. OptiPlexTOWER PC DESKTOP COMPUTER Network Card Dell Primary Drive or Optical Drive Genuine Microsoft Windows software preinstalled. 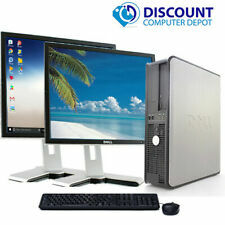 Fast Dell Windows 10 Desktop Computer PC C2D 2.13GHz Processor 1 Year Warranty! Customize Your Own Desktop Computer PC! Fast Shipping! SFF PC COMPUTER DESKTOP. OptiPlex PC COMPUTER DESKTOP Network Card Note: No promotional Product or software designed to slow performance of your Dell PC. Fast Dell Optiplex. Dell Primary Drive or Optical Drive. 240gb Solid State Drive. Tower Desktop. Dell Optiplex. Don't be fooled by Original Manufacturer (ex. Dell) disks. INCLUDES KEYBOARD MOUSE & WIFI. WINDOW 10 INSTALLATION CD AND NEW COA STICKER IS INCLUDED. 120gb SSD Unit. computer pc desktop sff. OptiPlex computer pc desktop sff Network Card Fast Dell OptiPlex. 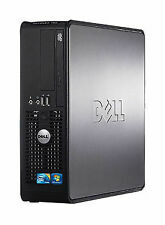 Dell Primary Drive or Optical Drive Genuine Microsoft Windows software preinstalled. INCLUDES WINDOW 10 HP INSTALLATION DISK. 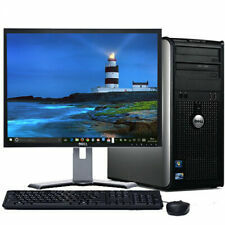 Fast Dell OptiPlex 760 PC COMPUTER DESKTOP. OptiPlex 760 PC COMPUTER DESKTOP Network Card Dell Primary Drive or Optical Drive Genuine Microsoft Windows software preinstalled. INCLUDES WINDOW 10 HP INSTALLATION DISK. FastDell OptiPlex. 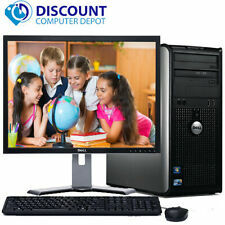 OptiPlex Network Card Dell Primary Drive or Optical Drive Genuine Microsoft Windows software preinstalled. WINDOW 10 hp 64BIT INSTALLED. INCLUDES WINDOW 10 hp INSTALLATION DISK AND NEW COA. HDMI Out Graphics Card! 1 Year Warranty! 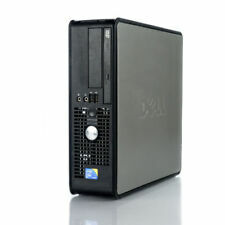 Fast Dell OptiPlex 960. OptiPlex 960 Tower Top PC COMPUTER Network Card 960 C.O.A. Tower PC COMPUTER Wifi. Dell Primary Drive or Optical Drive Window 10 HP 64. Includes window 10 installation cd and new COA. Note: This item is being sold ONLY with the parts / accessories shown in the photo. If it is not in the photo or stated in the includes section, it will not be in the package. [CrazyLister] (https://crazylister.com) For Media For Business For Home For School For Web Browsing (586) 285 - 1111 --- [Specs] (#elm_124_tabs-2) ---Condition Off-lease Refurbished PC ---Processor Intel Core 2 Duo Processor 2GHz ---Operating System Loaded w/ Genuine Microsoft Windows 10 Home SP1 W/ Certificate of Authenticity (COA) recovery partition included The Hard Drive is triple wiped and then a brand new Operating System is loaded ---Video Integrated Intel Graphics Media Accelerator ---Memory 8GB DDR Memory Installed ---Hard Drive 160GB Serial ATA 7200 RPM SATA (S.M.A.R.T. Technology to issue an alert if a hardware failure is pending) ---DVD/RW DVD/RW (plays and burns DVDs and CDs) ---External ports 8.0 x USB 2.0 ports (2 front, 6 rear) 1.0 x Ethernet Network (RJ45) 1.0 x VGA Out 1.0 x Stereo line-in 1.0 x Speakers, line-out, 1. 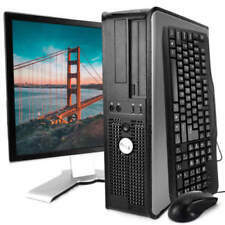 Fast Dell OptiPlex DESKTOP PC COMPUTER. OptiPlex DESKTOP PC COMPUTER Network Card Dell Primary Drive or Optical Drive INCLUDES WINDOW 10 HP INSTALLATION DISK. WINDOW 10 HP. 500 GB Unit. Don't be fooled by Original Manufacturer (ex. ). Fast Dell TOWER PC COMPUTER Wifi Ready. Dell TOWER PC COMPUTER Network Card DELL Primary Drive or Optical Drive Genuine Microsoft Windows software preinstalled. WINDOW 10 HP. An item that has been used previously. Fast Core 2 Duo. Wifi Ready! This has been my personal computer for several years, I bought it new. I believe the wireless adapter quit working so I have been using a USB wireless adapter for a couple of years. I did a swipe and factory reset that took it back to Windows 7 then re-installed Windows 10. Customize Your Own Desktop PC Bundle! 1 Year Warranty! FastDell OptiPlex. OptiPlex Network Card Dell Primary Drive or Optical Drive Genuine Microsoft Windows software preinstalled. WINDOW 10 hp 64BIT INSTALLED. WINDOW 10 hp. Don't be fooled by Original Manufacturer (ex. ). 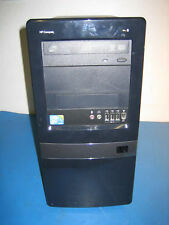 Fast Dell OptiPlex DESKTOP PC COMPUTER. OptiPlex DESKTOP PC COMPUTER Network Card 750GB Unit. Dell Primary Drive or Optical Drive INCLUDES WINDOW 10 HP INSTALLATION DISK. WINDOW 10 HP. Don't be fooled by Original Manufacturer (ex. ).